HTC at the Mobile World Congress in Barcelona on Sunday unveiled three new Desire-range smartphones, the Desire 530, Desire 630, and Desire 825 smartphones. The Taiwanese company also revealed the global variant One X9 smartphone, which was previously unveiled only for China. The company says that the three new Desire-range smartphones, which feature colourful rear panels complete with unique 'micro splash' paint speckles, will begin rolling out to both retailers and at htc.com, from March. The HTC Desire 530, Desire 630, and Desire 825 smartphones run Android 6.0 Marshmallow with Sense UI on top. The HTC Desire 530 will be the cheapest among the three unveiled at MWC and features a 5-inch HD display. The single-SIM Desire 530 is powered by a 1.1GHz quad-core Snapdragon 210 processor coupled with 1.5GB of RAM. The smartphone packs 16GB of storage and supports expandable storage via microSD card. The smartphone sports an 8-megapixel rear camera alongside a 5-megapixel front camera. It is backed by a 2200mAh battery. The Desire 630 also features a 5-inch HD display but unlike the Desire 530 will be available dual-SIM model only. It is powered by a 1.6GHz quad-core Snapdragon 400 processor coupled with 2GB of RAM. Rest of the specifications are the same as the Desire 530 with the only exception being the rear camera on the device. The Desire 630 packs a 13-megapixel rear camera and also houses BoomSound technology. The HTC Desire 825 shares a lot of identical innards with the Desire 630 smartphone. There are few differences as well as such as it features a 5.5-inch HD display. The HTC Desire 825 will be available in two variants - single-SIM and dual-SIM. The handset also sports a BoomSound stereo speaker with Dolby Audio enhancements and packs 2700mAh battery. The company also announced that the Desire 825 will come integrated with HTC Sensor Hub, a feature which will let users keep tabs on well-being and record activity, gestures and movement, and will provide real-time stats. The recorded data can be also automatically linked to fitness tracking apps such as Runtastic Running & Fitness, Runkeeper, Endomondo Running and Walking, and Google Fit. Lastly, the HTC One X9 featuring a similar design as the HTC One A9 was also announced. The company as of now has not detailed any pricing or availability details for the new One X9. To recall, the smartphone was launched at CNY 2,399 (roughly Rs. 24,400) in China. The HTC One X9 will be available in North Asia and EMEA from end of February 2016. The One X9 is a dual-SIM (Nano-SIM card) handset running the latest Sense UI interface on top of Android. It features a 5.5-inch full-HD (1080x1920 pixels) resolution with a pixel density of 410ppi and also packs Corning Gorilla glass coating. It is powered by a 64-bit octa-core MediaTek Helio X10 SoC, clubbed with 3GB of RAM. The handset includes 32GB of inbuilt storage and supports expandable storage via a microSD card (up to 2TB). On the camera front, the One X9 includes a 13-megapixel autofocus rear camera and a front-facing 5-megapixel fixed-focus camera. The 4G LTE supporting HTC One X9 is backed by a 3000mAh battery. Commenting on the launch, Chialin Chang, President of Sales, HTC said, "HTC has built its reputation on pairing industry-leading design with smart features. But with customers also seeking personalization, and individuality in addition to treating their phones as fashion accessories, we have needed to create something different. So today we're launching the most unique Desire devices yet." The company at the launch stressed that the new Desire range phones will be available in choice of colours. The Desire 630 and 825 will come in Stratus White Remix with duo colour micro splash and Graphite Grey Remix with gold micro splash. 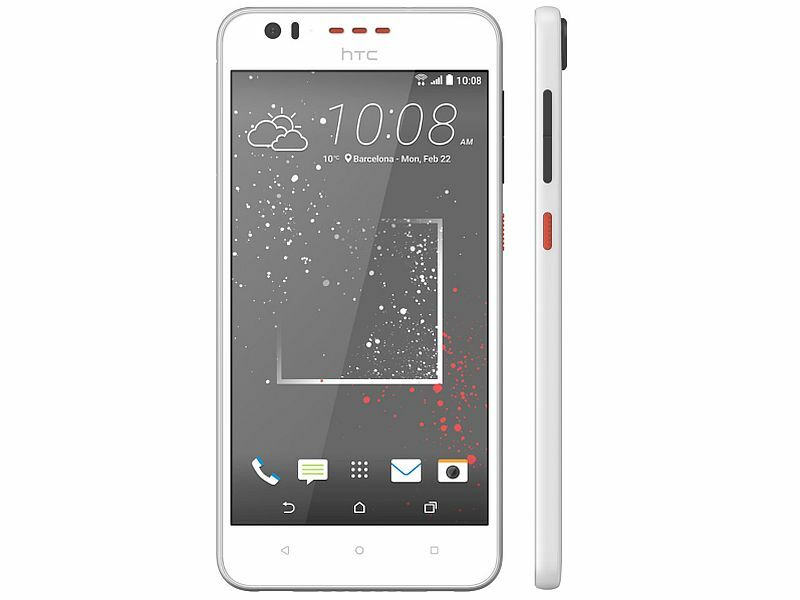 The Desire 530, on the other hand, will come in Graphite Grey and Solid Stratus White block colours. The new Desire range packs polycarbonate shell with specially created micro splash effect. "Playing to people's personal tastes, their desire to be different and the fact that smartphones are now as much of a fashion accessory as they are a personal hub, HTC's design team employed a paint process that treats each phone as a canvas," notes HTC in its press statement.